Well, another week, another Monster Magnet concert! Sometimes it happens. I rode my bike over to Pumpehuset at about 3:45 and immediately found Ed, playing his new Eagle guitar in the backstage. The stage was almost set of soundcheck but Phil and Bill were off at the Bass Lab, right next to my apartment. Bill picked up two new pedals. This is the store I wanted to take Ed to the week before but we never made it. We hung out and talked for a while. We talked about Ted Nugent a lot as we are both big fans (of the music and not his politics). Bob, the new drummer, has a small studio and he and Ed have demoed some cover tracks that the rest of the guys are going to put on some other guitar and Dave some vocals. Mesmerization Eclipse by Captain Beyond sounds really cool and Bomber by the James Gang as well. They made it a short version. Anyway, Bob and Ed run through Mesmerization Eclipse and Ed plays some of Stranglehold while the rest of the guys get ready. They run through on the Verge, Snake Dance and one other song. That was it. I went home and came back at 7:00. I brought some DVD’s that we were going to watch later. Ed was psyched. The Quill start at 8:30 and there is my friend Michael and I and no one else. As they play, people start coming up from the downstairs bar. They sound really good but play the same exact set as when I saw them in Malmö. The band said they have been playing the same five songs for the last month. I think this is strange. Must be damn boring to play these songs. Anyway, they rock out and I really want to see these guys play a headline show. They said they always do some jamming. Only songs from the latest 2 cds are played. I only own the first two. After a short break, Gluecifer hit the stage. I missed the first 10 minutes or so as I was talking to Dave Wyndorf backstage. I come out and met up with Kai and Susan, Morten and some others. I see Morten and Lene, whom I travelled to Malmö to see the band last week. They are right on the barrier in front of where Phil stands. All the guys in Gas Giant are here and many of their friends that I know as well. A sold out crowd on this night! 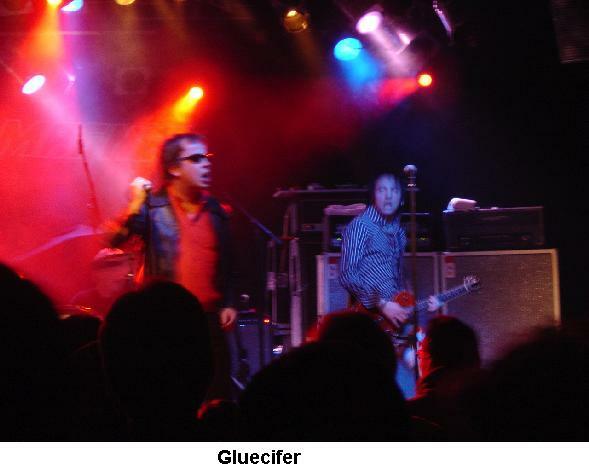 Gluecifer play a really different set and totally rock. The crowd loves them as well. I like this band more and more. Soon it is time to rock with Monster Magnet. The crowd is high and totally ready to rock. The band opens with Bummer and it seems a bit more extended than in Malmö. For those who don’t know, the song takes its main riff from the Hawkwind song, Time We Left This World Today from the Doremi Faso Latido LP (1973). Tractor is next and the crowd are going crazy up in the front. Dave is already sweating like mad. Tim has the acid blobs projected onto the white backdrop with the bullgod. You can hardly see them at all, unless the lights are dim. They only show up during 3 songs in the set (Dinosaur Vacuum, Zodiac Lung and Spine of God), when the lighting is low. I think Tim uses too many yellow and white lights and you can hardly see the stuff at all. Anyway, the first new song Supercruel, is going over well and Powertrip, has the crowd really jumping. The guitars are good and loud tonight. Melt, a great song, follows. The hit from the new CD, Unbroken is ok. It is probably my least favourite song on the new CD. Now my favourite part of the show, Dinosaur Vacuum>Brainstorm>Dinosaur Vacuum>Zodiac Lung! Great powerful stuff. This crowd really digs the old stuff. Radiation Day, one of the best songs on the new CD is a killer and a longer more extended Monolithic Babies follows. The band ends the set with Negasonic Teenage Warhead and Space Lord Mutherfucker! The encore, Dave asks if people are ready for some Space Rock and they are. The Right stuff by Bob Calvert sounds awesome. A 20 minute far out version of Spine of God finished the show. Phew... Great show again. I had hoped for some different songs from a week ago, but no changes yet. After the show I hang out with Ed until about 1:30 on the bus where we watch some of the Rory Gallagher Irish Tour '74, Ted Nugent Rockplast '76, Allman Brothers - Live at the Beacon 2003 DVDs. Awesome stuff. Now we head over to the after show party at Tex. I sit at the table with Ed, Dave, and Bob and a lot of girls. Everyone is getting drunk (Except Dave, only drinking water and smoking cigs!). We talk some US politics and other stuff. He is such a cool guy. Occasionally some people come over for autographs but not many. The place is packed. I leave at 3:30 with Dave and the Swedish girl who has been hanging with the band the last 3 days. The bus will leave for Århus at 4, so the guys need to hurry if they are to get laid. The life of the rock and roller.